LOS ANGELES -- For families in the planning stages of their beloved daughter's quinceañera, or for those looking to relive their fondest teen memories, HBO has an early holiday gift starting Tuesday, December 19th, which will run nightly through Friday, December 22nd. 15: A QUINCEAÑERA STORY, is a collection of four short films documenting the planning and celebration of a Hispanic rite of passage, the Quinceañera. A fifteenth birthday party, known informally as a "quince"-- is a ritual for many Latino cultures, with party planning running the spectrum from modest celebration to the more elaborate "My Super Sweet Sixteen" type of parties featured on MTV. Zoey (debuts Dec. 19) is a young Mexican-American living south of Los Angeles who was assigned male gender at birth and celebrates with her mother and her trans-madrinas (godmothers) who live vicariously through her. Rosi (Dec. 20) is an American growing up in Florida with a mother from Guatemala and a father from Cuba. She combines all three of her cultures for a quinceañera in Havana, where she chooses to celebrate with her beloved grandfather -- who cannot get a visa to the U.S.
Ashley (Dec. 21) is an amateur boxer living in East Los Angeles, her mother is a "Dreamer". She is as nervous about her first official fight as she is about her quinceañera. Jackie and Nina (Dec. 22) are two best friends from San Antonio, who decide to honor their multi-generational Mexican American heritage by mixing their joint quince with their love of escaramuza, a traditional Mexican horse-dancing display. Directed by Emmy® winner Matthew O'Neill and Latin Grammy-winning recording artist Thalía Sodi, and executive produced by legendary music mogul Tommy Mottola, the films capture the dynamic experience of this very special event. It also conveys the subtle differences in each girl's background—whether it be social, cultural, or economic. The shows will also be available on HBO On Demand, HBO NOW, and HBO GO. NBC Latino talked "quince" party planning with two of the featured "Quinceañeras", Ashley Lopez and Zoey Luna, ahead of a documentary film screening at Casa 0101 Theater in Boyle Heights, a Latino neighborhood in Los Angeles. This is the same neighborhood where Ashley lives and trains. She arrives early and manages to contain the nervous excitement of being so close to home for this screening. Zoey arrives shortly after, casually dressed and rocking a sharply done "cat-eye" eyeliner. Both are now 16-years-old, and they are in their junior year at different area high schools. In the films, Ashley battles stereotypes as a female boxer, while Zoey breaks stereotypes as a young lady who transitioned earlier in her adolescence. These are their thoughts as they look back on the magical day they celebrated their QUINCE. What is a Quinceañera? What does it mean to you? ASHLEY: A quinceañera is the process of growing up from being a child, like a little girl, to becoming a woman. You start becoming more independent. You start looking at life differently... and you start giving yourself more goals and thinking about your future in a deeper way. ZOEY: It is a rite of passage, essentially a way of becoming a woman. How important was it for you to have a Quinceañera? ASHLEY: Both my family and my neighborhood take quinceañeras very seriously (laughs), because I live in a Hispanic neighborhood. Almost every girl around here has one. In my family, my grandma threw my mom and my aunts a quinceañera. I was the first (in her family) with a quinceañera, so it was something very special to everyone. We just couldn't wait. Ever since I was 12, they would tell me, "you're gonna have this, and that", and they were just so excited. ZOEY: It's so important to me because I never thought I'd be able to express my femininity, and it's just very rewarding getting to experience my quinceañera. It's amazing. I always said I wanted a quinceañera, I always said I wanted long hair, and I always said I wanted to be able to put on makeup. A lot of people told me that was impossible because of the way I was assigned male at birth. But, I always knew in my heart that even if I didn't transition at the age I did (age 11), I'd have a quinceañera and have my favorite moments-- even if I had a crazy one at age 30. A quinceañera is more important than having a Sweet 16 because it's representing my culture. 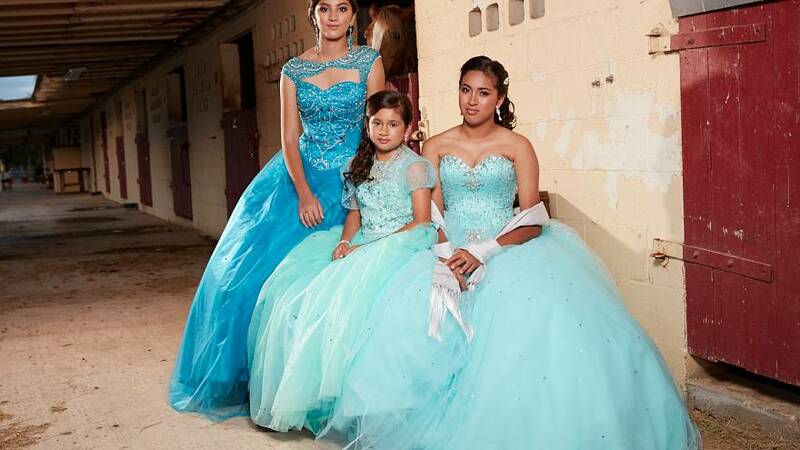 How was the experience of documenting your Quinceañera? ASHLEY: I think it made it more special and more stressful, no offense (laughs). I had it in me that everything had to be perfect, because it was gonna come out on TV. I was like, "I have to have a good dress-- a good dance-- the decorations have to be good." And then, my fight was also filmed, so that just put more stress on top of me. But it was also a fun experience! ZOEY: The experience of watching the quinceañera after it was made and edited versus living though it was very different. Living through it was kind of hell sometimes because I wanted to make sure that everything would be perfect. It was very interesting watching it because it seems all put together and cleaned up and I feel like I wasn't necessarily put together and cleaned up during the filming. How did you find your dress? How did you feel in your dress when you saw yourself? ASHLEY: At first, I was like, I know I want a blue dress. Turquoise is a beautiful color. Then I thought, I'm gonna go for a coral color-- like a peach color. I just walked into the store and saw the pink dress and I was like-- I want that one. I want it. And I tried it on and I was like-- this is my dress-- and that was it!I felt like a princess. Now when I wore the dress with my boxing gear, at first i was like, I'm gonna put on my gloves and my dress? What is that? How is this gonna work? Then when I put them on, I just looked down at my gloves and I was like, THIS IS WHO I AM! ZOEY: I was really tired. We had done a lot of filming and I knew I wanted a specific type of dress. I wanted something that wasn't poofy, which is kind of ironic because I got something that's very poofy and layered. And I really wanted something that was pink. I go into the store, and it was a lovely woman who makes the dresses and she's transgender too, so, even better. I saw this beautiful lilac/pinkish type of dress, and I was like I have to have that one. That just screams my name, and purple's the color of royalty. I was like, I gotta do it. What's your favorite part of the documentary? ASHLEY: That night, my favorite part was dancing with all my chambelanes (male court). It was just like a cool vibe, like everyone was just enjoying the moment and not stressing about anything. But, now that I watch it, I'm confused! (Laughs) There's a specific part where I'm sitting down in a chair and my coach is putting the crown on me , and everything he told me, I feel as if he's still telling me right now. There's also a part where my mom is talking to me, and I'm gonna be honest, I couldn't really hear her. Now that I watch it, I'm like, OH! She said all that! (Laughing), so I kind of understand her more. Best advice for planning a QUINCE? ASHLEY: Basically stay true to yourself and be who you want to be, not what others expect you to and want you to be. Plan the quinceañera with time and don't leave anything to the last minute, because it will pile up and you will stress. Choose your quinceañera themes and your colors based on how you want it to be. I know it's traditional, but don't be so forced to be. Just go for it! Be yourself! Have fun! ZOEY: I suggest that they really focus on getting a therapist while having a quinceañera because it's very stressful. There are so many people that have an opinion and they want to throw things at you. You should have a very relaxed type of mindset and you should just know what you want and you should be strong in your opinion in what you want. ASHLEY: I'm trying to still figure out myself, because now that I'm a junior, we're learning a lot more about colleges. I don't know if I want to go into film school or if I should go to law school, or if I should stop with both and focus full time on boxing. That's kind of where I'm at right now. ZOEY: I dont really have plans for college. I'm just trying to graduate. I really want to start my YouTube channel. My YouTube channel ideally would be a place where I could connect with people and tell them they're not alone, by sharing some of my experiences in life. I love being in the public eye. It's such an honor to be recognized as a voice for my community. I definitely want to do more.